Longfly is a BakuVice Super Assault Bakugan. When opened, it has a giant spring, like Clawsaurus, so it will shoot out a fly-like Bakugan. It has been shown on an issue Beckett Bakugan Magazine. 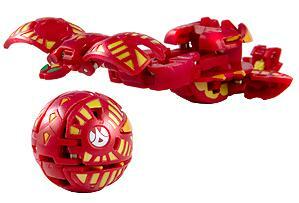 Currently, it is the second strongest Bakugan, (after Scaboid), as its Pyrus version has a G-Power of 1150 Gs. The Haos version has 1100 Gs. It's Ventus Version has 1250 Gs or 1100 Gs and the Subterra Version has 1150 Gs. It is the longest Bakugan. Purchase your Longfly Bakugan from Amazon now!